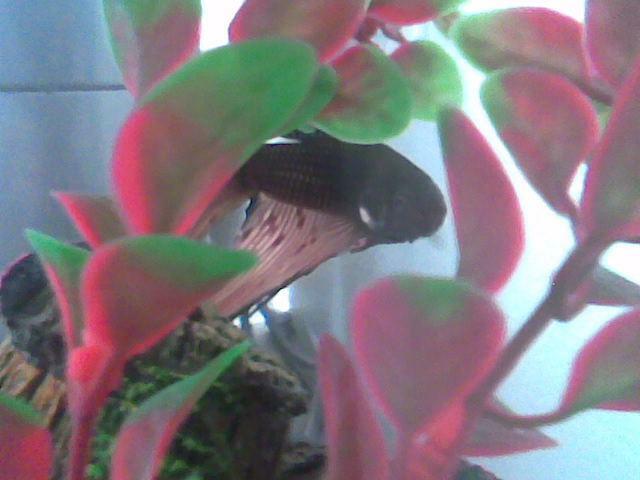 Charade, our beloved Betta fish for 3 years, passed away this afternoon. He spent his last few hours in his favorite spot (a little place at the top of his bowl where he could rest on a plant pedal) with us close by. The last few weeks have been hard to see him in such pain. It is suiting that he left us on a Sunday. Charade always enjoyed the peace and calm that Sundays always bring. We picked Charade up from the Petsmart in Logan, UT on February 29, 2008. Charade was a fish of all fish. He had a great subtle blue color with subtle red fins. Charade was liked by everyone who had the opportunity of seeing him. He was a humble fish. Not being as colorful as some of the other Betta fish, he had a rough growing up years, but he found happiness where ever he was and whatever the circumstance. He could see the good in everyone. He really loved his bowl, his plant, and his barrels. He enjoyed spending time swimming, making bubble nests, and showing off his amazing moves and flashing his sleek looking fins. He liked to eat Betta fish pellets as well as freeze-dried blood worms. He also enjoyed watching good movies (his favorite being Finding Nemo). You could always count on Charade being there for you. When you needed someone to talk to or watch swim around, he was there. When you had a bad day, he was there to cheer you up. Charade also had his bad days. During the winter months of 2009 he moved into a bigger bowl which he greatly disliked. He went on a hunger strike, not eating for about 3 months, until he was moved back into his 1 gallon bowl and got comfortable again (sorry about that buddy). As Charade got older, he needed a little more special attention as his eye sight started to fail. Food was strategically placed and poked down in the water to indicate where it was. He enjoyed life, the good and the bad. He took every chance to get out and see the world (the best he knew how as a fish). Charade came with us on trips to Salt Lake and he even spent a few days in Bountiful with a friend. Charade was so likable and inspiring that stories were even written about him. Just like Charade left an empty bowl, there is a spot in my heart (bowl shaped) that is now empty. Charade has gone on to swim with his fish friends in heaven. May we all remember Charade and his wonderful life. I would like to close with one of his favorite quotes: When you are faced with waves of tribulation, remember the wise words of Dory - "Just keep swimming." Charade was preceded in death by Remington Steel and is survived by owners Lou and Lou's wife. Bowlbearer, Lou. Flushing was held at 8pm and words were spoken by Lou and Lou's wife with a special musical number sung by Lou's wife ("Each Fish That Touches Ours For Good"). In lieu of flowers, Charade requested money be donated to NFWF. This one is for you Charade, and that is How Lou Seas It.